When a patient is fighting a brain tumor, pathologists usually obtain a tiny bit of the tumor, either through a biopsy or after surgery, and prepare a microscope slide. Looking at the slide, they can sometimes (but not always) tell what type of tumor it is. That allows them to have an answer, however tentative, for that critical question from the patient: “How long have do I have?” as well as give guidance on what kind of treatment will be best. What genes tend to be turned on or off in the various types of brain tumors? What does the pattern look like when a tumor is running out of oxygen? 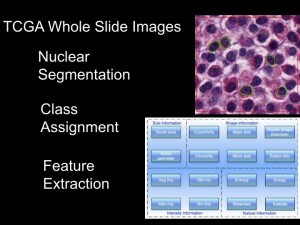 What if we get a “robot pathologist” to look at hundreds of thousands of brain tumor slides? 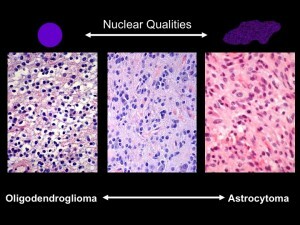 Under the microscope, the shapes of cell nuclei in brain tumors look different depending on the type of tumor. Brat was speaking at a caBIG (cancer Biomedical Informatics Grid) conference, taking place at the Emory Conference Center this week. caBIG is a computer network sponsored by the National Cancer Institute that allows doctors to share experimental data on cancers. Brat explained that low-grade brain tumors come in two varieties: oligodendrogliomas andÂ astrocytomas. Under the microscope, cell nuclei in the first tend to look round and smooth, but the second look elongated and rough. Kind of like the differences between an orange and a potato, he said.Â He and colleague Jun Kong designed a computer program that could tell one from the other. They had the program look through almost 400,000 slides, using resources compiled through caBIG (Rembrandt and Cancer Genome Atlas databases). Sifting through the data, they could find that certain genes are turned on in each kind of tumor. Imagine a "robot pathologist" that can sift through thousands of images from brain tumor samples. Eventually, this kind of information could help a patient with a brain tumor get good responses to those “How long?” and “How am I going to get through this?” questions. 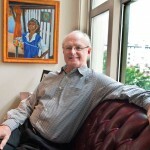 Joel Saltz, who leads Emory’s Center for Comprehensive Informatics, has been a central figure in developing tools for centers such as Emory’s In Silico Brain Tumor Research Center.Â In September 2009, Emory wasÂ selected to host one of five “In Silico Research Centers of Excellence” by the National Cancer Institute. Scientists at Emory studying muscle repair have discovered an unexpected function for odorant receptors. Odorant receptors’ best known functions take place inside the nose. By sending signals when they encounter substances wafting through the air, odorant receptors let us know what we’re smelling. Working withÂ pharmacologist Grace Pavlath, graduate student Christine Griffin found that the gene for one particular odorant receptor is turned on in muscle cells during muscle repair. The activation of the odorant receptor gene MOR23 is visible in muscle tissue in pink. Cell nuclei appear as blue. The finding could lead to new ways to treat muscular dystrophies and muscle wasting diseases, and also suggests that odorant receptors may have additional unexpected functions in other tissues. While we’re on the topic of odorant receptors, a great article in November’s Howard Hughes Medical Institute Bulletin describes Emory psychiatrist Kerry Ressler’s work with Linda Buck when he was a graduate student. â€œI had never thought about smell a day in my life until I heard Linda give her talk,â€ Ressler says, still jazzed by the memory, â€œand I was absolutely blown away.â€ Buck had methodically identified about 1,000 odorant receptor (OR) genes and she outlined an orderly plan for decoding their function. Ressler and his colleagues at Yerkes National Primate Research Center now study how fearsome memories become lodged in our brains. Since smell is often described as accessing the most primitive parts of the brain,Â the connection between Ressler’s past and present makes sense. If the brain acts like a computer, which of the brain’s physical features store the information? Flashes of electricity may keep memories and sensations alive for the moment, but what plays the role that hard drives and CDs do for computers? Each neuron has only two copies of a given gene but will have many dendrites that can have more or less RNA in them. That means the last two modes of regulation offer neurons much more capacity for storing information. Gary Bassell, a cell biologist at Emory, and his colleagues have been exploring how RNA regulation works in neurons. 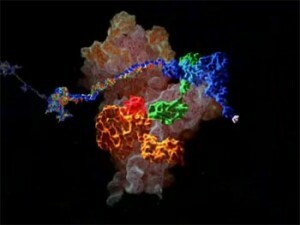 They have developed special tools for mapping RNA, and especially, microRNA — a form of RNA that regulates other RNAs. Fragile X mental retardation protein (FMRP), linked to the most common inherited form of mental retardation, appears to orchestrate RNA traffic in neurons. Bassell andÂ pharmacologist Yue Feng recently received a grant from the National Institute of Child Health and Development to study FMRP’s regulation of RNA in greater detail. The grant was one of several at Emory funded through the American Recovery and Reinvestment Act’s support for the NIH. 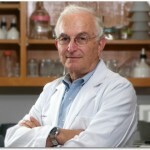 In the video interview above, Bassell explains his work on microRNAs in neurons. Below is a microscope image, provided by Bassell, showing the pattern of FMRP’s localization in neurons. NADPH oxidases (Nox for short) are enzymes that help plants fight off pathogens, guide sexual development in fungi, are essential for egg laying in flies and even help humans to sense gravity. But what first attracted the interest of Emory researchers was the role of Nox in vascular disease and cancer. Along with Emory cardiologist Kathy Griendling, pathologist David Lambeth pioneered the discovery of how important these reactive oxygen-generating enzymes really are. Lambeth will be honored this month in San Francisco by the Society for Free Radical Biology and Medicine with their 2009 Discovery Award.Â A profile in Emory Report explores his musical and artistic pursuits as well as his science. At a recent Society for Neuroscience (SFN) meeting, Emory researchers described their efforts to learn about optimizing progesterone for treatment of traumatic brain injury. Researcher Donald Stein, PhD, Asa G. Candler Professor of Emergency Medicine at Emory School of Medicine, has shown that progesterone can protect damaged brain tissue. 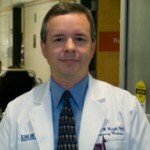 Stein is director of the Department of Emergency Medicine’s Brain Research Laboratory. One of the Emory SFN presentations covered efforts to find progesterone analogues that are more water soluble. This work comes from Stein and his colleagues in collaboration with the laboratory of Dennis Liotta, PhD, Emory professor of chemistry. Currently, the lack of water solubility limits delivery of progesterone, in that the hormone must be prepared hours ahead and cannot be kept at room temperature. Small chemical modifications may allow similar compounds with the same effects as progesterone to be given to patients closer to the time of injury. According to the results, two compounds similar to progesterone showed an equivalent ability to reduce brain swelling in an animal model of traumatic brain injury. The second Emory report described evidence that adding vitamin D to progesterone enhances the hormone’s effectiveness when applied to neurons under stress in the laboratory. Like progesterone, vitamin D is a steroid hormone that is inexpensive, has good safety properties and acts on many different biochemical pathways. The authors showed that a low amount of vitamin D boosted the ability of progesterone to protect neurons from excito-toxicity , a principal cause of brain injury and cell death. A new study at Emory, slated to begin early 2010, will evaluate progesterone’s effectiveness for treating traumatic brain injury in a multisite phase III clinical trial called ProTECT III. The study follows earlier findings that showed giving progesterone to trauma victims shortly after brain injury appears to be safe and may reduce the risk of death and long-term disability. 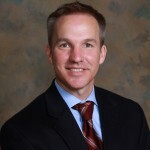 David Wright, MD, assistant professor of emergency medicine at Emory School of Medicine is the national studyâ€™s lead investigator. Michael Frankel, MD, Emory professor of neurology, will serve as site principal investigator of the clinical trial at Grady Memorial Hospital. T cells start to lose their identities as they get older, recent Emory research indicates. Immunologists Cornelia Weyand and Jorg Goronzy, who are codirectors of the Lowance Center for Human Immunology at Emory University School of Medicine, have a just-published paper in the journal Blood describing this phenomenon. Weyand and Goronzy show that with age, T cells begin to turn on genes that are usually turned on only in â€œnatural killerâ€ cells. NK cells play a major role in rejecting tumors and killing cells infected by viruses. They are white blood cells like T cells but they have a different set of receptors on their surfaces controlling their activities. Many of these receptors act to hold the NK cells back; so when they appear on the T cells, their activation is dampened too, thus contributing to the slowing down of the immune system in elderly people. The authors report that NK cell genes get turned on because they lose the â€œmethylationâ€ on their DNA. Methylation is a pattern of tiny modifications on DNA, emphasizing whatâ€™s important (or forbidden) in a given cell, sort of like a highlighterâ€™s yellow pen on top of text. Apparently, in elderly people (aged 70-85), the methylation is more â€œspottyâ€ than in younger people (aged 20-30). It seems that after the DNA is copied several times, the highlighting gets fuzzy and the T cells start to look like their cousins, natural killer cells. Much of the time in biochemistry, when you want to know what’s happening inside a cell you have to break them open. Fluorescent proteins are a great tool and deserved their Nobel Prize. But you have to convince your favorite cells to make the fluorescent proteins first. It’s possible to think of specialized non-invasive probes too: dyes that change color when they encounter calcium, for example. Now imagine being able to decipher what’s going on inside cells simply by looking at them and watching the proteins and organelles shift in response to signals. That’s essentially what Yuhong Du and Haian Fu at the Emory Chemical Biology Discovery Center have been able to do. They use an “optical biosensor” which puts cells in front of a reflective grating. Depending on how the grating reflects light, they can measure mass redistribution inside the cells. With this technology, they could watch for responses as cancer cells responded to signals from EGFR (epidermal growth factor receptor). Drugs such as gefitinib and erlotinib are supposed to block those growth signals in lung cancer cells, but not every cancer responds to them. These results suggest that the optical biosensor system could be used to screen for compounds that block EGFR and many other receptors, potentially speeding up the hunt for drugs against several diseases. Congratulations to Elizabeth Blackburn, Carol Greider and Jack Szostak for the 2009 Nobel Prize in medicine. The award is for their work on telomeres, the protective caps on the ends of chromosomes that shorten with every cell division and need specialized enzymes to be replenished. 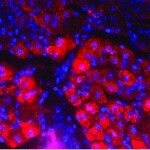 Greider, Blackburn and Szostak discovered telomerase, the enzyme that copies the ends of chromosomes using a special RNA template. Telomerase is turned off in most human cells, but cancer cells often must reactivate it so that they can keep dividing like crazy. 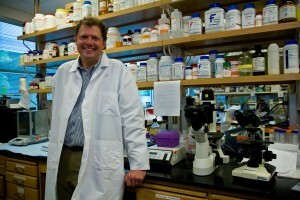 The discovery of telomerase has led to new leads for potential anticancer drugs. This is a good example of the impact basic research can have on medicine, since the prize-winners were not thinking about anticancer drugs in the 1980s when they were doing their work. 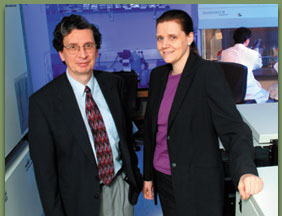 The telomere trioâ€™s work relates to several lines of research at Emory. Immunologist Cornelia Weyand and her colleagues have shown that the telomeres of T cells are abnormally shortened in patients with rheumatoid arthritis. In effect, their cells’ chromosomes are prematurely aged. This result provides some hints on how to treat autoimmune diseases. If blood-forming stem cells can’t keep their telomeres in shape, they can’t continue to regenerate the blood. Pathologist Hinh Ly’s research has made a connection betweenÂ genetic defects in telomere maintenance and bone marrow failure syndrome in human patients. Geneticists Christa Martin and David Ledbetter have been probing the relationship between mutations or recombination in the regions of the chromosome adjacent to telomeres and developmental disorders such as autism and mental retardation. The 2009 Nobel Prize in Chemistry, awarded to Venki Ramakrishnan, Tom Steitz and Ada Yonath, has an even stronger connection to Emory. Christine Dunham, part of a growing contingent of crystallographers here, worked on ribosome structure in Ramakrishnan’s lab at the MRC. She is examining the molecular details of how antibiotics and viruses perturb ribosome function. What the two Nobels have in common is that they both honor work on molecular machines containing RNA, connections to the ancient, shadowy “RNA world“. Whoa. This quote comes from a recent Nature paper. How did studying the protein that helps cells respond to the stress hormone cortisol inspire such philosophical language? Biochemist Eric Ortlund at Emory and collaborator Joe Thornton at the University of Oregon specialize in â€œresurrectingâ€and characterizing ancient proteins. They do this by deducing how similar proteins from different organisms evolved from a common root, mutation by mutation. Sort of like a word ladder puzzle. Ortlund and Thornton have been studying the glucocorticoid receptor, a protein that binds the hormone cortisol and turns on genes in response to stress. The glucocorticoid receptor is related to the mineralocorticoid receptor, which binds hormones such as aldosterone, a regulator of blood pressure and kidney function. 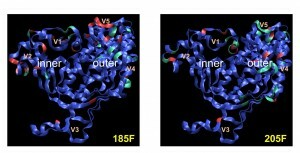 The reason: Mutations arise amidst a background of selective pressure, and mutations in one part of a protein set the stage for whether other ones will be viable. The researchers describe this as an â€œepistatic rachetâ€. 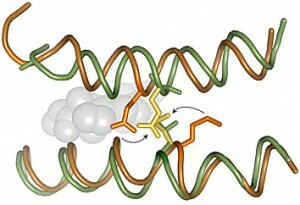 Mutations that occurred during the transformation between the ancestral protein (green) and its descendant (orange) would clash if put back to their original position. This work highlights the increasing number of structural biologists like Ortlund, Christine Dunham, Graeme Conn and Xiaodong Cheng at Emory. Structural biologists use techniques such as X-ray crystallography to figure out how the parts of biologyâ€™s machines fit together. Recently Emory has been investing in the specialized equipment necessary to conduct X-ray crystallography. As part of his future plans, Ortlund says he wants to go even further back in evolution, to examine the paths surrounding the estrogen receptor, which is also related to the glucocorticoid receptor. Besides giving insight into the mechanisms of evolution, Ortlund says his research could also help identify drugs that activate members of this family of receptors more selectively. This could address side effects of drugs now used to treat cancer such as tamoxifen, for example, as well as others that treat high blood pressure and inflammation. HIV doesn’t have a brain and it doesn’t strategize. But the way that the virus mutates and evades the immune system in the early part of an infection, you might think it did. Red and green depict the parts of the HIV envelope protein that mutated in two patients (185F and 205F) in response to pressure from their immune systems. Recently there has been some excitement over the discovery of robust neutralizing antibodies in patients. The bottom line, according to Derdeyn’s team: even if a vaccine succeeds in stimulating antibodies that can neutralize HIV, the virus is still going to mutate furiously and may escape those antibodies. To resist HIV, someone’s immune system may need to have several types of antibodies ready to go, their results suggest. A companion paper in the same issue of PLOS Pathogens from South African scientists has similarly bracing results.